He is the man behind The Boogeyman Dollar Baby Film. 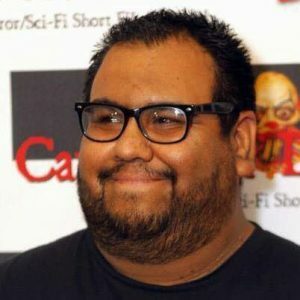 Mando Franco: I’m a writer/director from Los Angeles. I walk the fine line between extrovert and introvert. I’m a mega movie and comic book fan. I’m fascinated by the strange and macabre. SKSM: When did you make The boogeyman? Can you tell me a little about the production? How much did it cost? How long did it take to film it? Mando Franco: We shot Boogeyman at the beginning of 2013 over 7 days. Most of the shooting took place in Pasadena and Hollywood, California. We raised just over $6000 dollars through indigogo and various donations. It was shot on a Cannon 5D and made out of love for the horror genre. SKSM: How come you picked The boogeyman to develop into a movie? What is it in the story that you like so much? Mando Franco: I read the short story years ago, and It just kinda stuck with me. Like, something about it was creepy and out there, and I just throught this could be a very freaky flick and has a different spin on the legend of Boogeyman. I’m a fan of small intimate films set in single locations. The story is just 2 men talking and 1 of them telling the awful and terrifying story that is so out there, it almost sounds real. There is a real grounded take on who/what the boogeyman is and could be, and I was just intrigued by it. Mando Franco: I honestly can’t remember where I heard about it. And I’m a big fan of Frank Darabont, who made the original Dollar Baby, and I remember reading something about it. Anyway, I just finished a stint on a webseries and I was looking for what to do next, and I happened to be reading THE NIGHT SHIFT, which is the book with the boogeyman short story. Then I remembered the Dollar Baby thing, so I went on the site and there it was. I talked to some friends and collaborators about it and then, I sent Mr King a dollar. Not a check, I just sent a dollar once I choose to do this. Mando Franco: It’s hard to single out 1 moment. It was a labor of life and a tough shoot, but it was a blast. We had a really solid cast and crew. Some old friends, some new friends, and we just meshed really well. The film came out way ahead of any expectations I’d had. We all stepped up our game. One shot we got that just made me giddy was this simple shot of The Boogeyman’s green slim dripping off a doorknob. It was a last minute gag I wanted in a shot, and it was perfect. The slime dripped off a doorknob at the right time… We all silently showed our excitement, then I called cut and we all yelled and cheered. It’s not a big thing, but at the moment, you could tell we were all so happy to be there and make something wicked cool. Mando Franco: It’s kinda a bummer. I mean, I get it, but under the right controlled circumstances it would be nice, but you never know. SKSM: What “good or bad” reviews have you received onyour film? Mando Franco: I never heard any compliants. Every screening I went to had an amazing reaction. Scares, thrills, chills and 1 big punchline. 1 screening in particular had Boogeyman paired up with some other horror films for block of shorts. Myself and the other directors did a Q&A and upon announcing us, Boogeyman got the biggest applause, and was the audience favorite of the night. That’s when I knew for sure, we had a winner, and this is what I’m supposed to do. This is where I’m supposed to be. Mando Franco: We screened all over LA. We did a Stan Lee Comic Con SK Panel, with a QandA, and we did Shriekfest, one of LA’s biggest genre festivals on closing day, so I think it doesn’t get better than that. Oddly enough, I’m still getting requests and I’m happy to keep sharing it with horror and SK fans alike. Mando Franco: Oh yeah, for sure. I love his short stories and novella’s. On of my favorite short stories no one ever talks about it is, I KNOW WHAT YOU NEED. Also in the NIGHT SHIFT. It’s so simple and scary, but not in the traditional sense. It’s like a creepy vibe more than anything. I’d love to make that one, one day. As for films, my favorite of King’s is MISERY. I also love The Mist, ShawShank Redemption and the new IT. There’s also Thinner, Needful Things and Pet Semetary. I can go on and on. Mando Franco: No, I wish. I got a standard letter that goes out to the DB filmmakers, but that’s about it. 1 condition is that he gets a copy of the film. Hopefully he’s seen it and liked it. SKSM: Do you have any plans for making more moviesbased on Stephen King’s stories? If you could pick -at least- one story to shoot, which one would it be and why? Mando Franco: As of now, no. I’d love to do another DB at some point, or maybe even a feature. If I made a King book it would be that short story I mentioned earlier. I always thought Geralds Game would of been a good/impossible movie to make, but someone did it. And did it well. Mando Franco: Mainly writing at the moment. I’m planning on doing a feature in a year or so, but as of now, just writing. I have a script being optioned, but I’m also working on some side projects and doing a podcast with my girlfriend. Mando Franco: Even though I make dark and morbid films, I’m not a dark and morbid guy. I’m really friendly and goofy and the last person you’d expect to venture into the darkside of storytelling. Most would think I’d make comedies. Mando Franco: Thank you for all the support, and the best is yet to come. Mando Franco: When you make a movie, your cast and crew are everything. You don’t always have to have all the answers, but don’t be afraid to lead. Thanks so much!